The magnitude 6.5 earthquake, which shook large portions of Northern California and Southern Oregon during the late afternoon of 9 January 2010, was the strongest temblor to hit our state in more than six years. The last strong earthquake occurred shortly before Christmas in 2003, when a magnitude 6.6 quake rattled the area around Hearst Castle, the Paso Robles Region and the coastal towns of San Luis Obispo County. Two people were killed in the San Simeon Earthquake, as the 2003 temblor is now known. It caused widespread structural damage in Paso Robles, where several buildings collapsed. In contrast, only a few people were injured in Saturday's quake. The damage was largely confined to coastal cities in Humboldt County. A report by the Redwood Coast Tsunami Workgroup describes damage to residential and commercial buildings, as well as to roads and other infrastructure totaling almost $30 million. 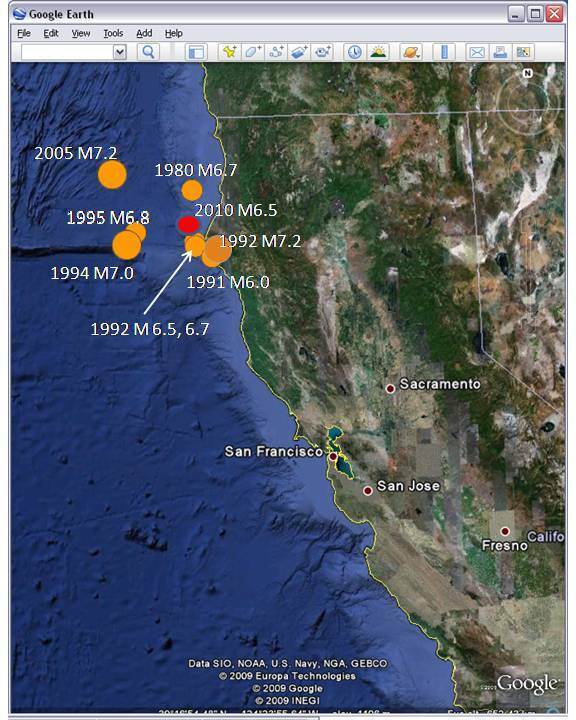 Almost ten earthquakes with magntitudes of 6.0 and larger occurred in the greater region of the Mendocino Triple Junction along California's North Coast during the last 30 years. The offshore epicenter of Saturday's quake is marked in red. While the North Coast escaped major damage this time, the region between Cape Mendocino and the Oregon border sure had its share of deadly quakes in the last half century. One person was killed on December 21, 1954, when a magnitude 6.5 temblor struck a few miles East of Arcata. On November 8, 1980 a 7.2 quake occurred off the coast of Humboldt County. Two people were injured, when portions of on overpass of Highway 101 collapsed on the train tracks below. A whole series of strong quakes, ranging in magntiude between 7.2 and 6.5 rattled the area in late April 1992. Ninetyfive people were injured and the shaking caused major damage and several landslides in and near the towns of Ferndale, Honeydew, Petrolia, Rio Dell, and Scotia. The strongest of these Petrolia Earthquakes, as the series is now commnonly known, generated a tsunami, with wave heights of up to four feet in Crescent City. Hours later, this tsunami was even detected in Hawaii, where it had a run-up of less than a foot. The last strong earthquake in this area occurred on June 15, 2005, when a magnitude 7.2 temblor rattled the sea floor roughly 100 miles offshore. Although the quake was felt in Humboldt County, no damage occurred on land.